We're big fans of mechanical gaming keyboards here at TechRadar. We appreciate anything from multi-color backlighting all the way to dedicated macro keys, but it's the various tactile switch types that get our fingers excited. Little did we know that we would be experiencing a brand-new switch for the first time at Razer's booth at IFA 2016. Like other mechanical keyboards such as the SteelSeries Apex MX800 and Cherry MX Board 6.0, the Ornata features a low-profile design. This means that the height of the keys is lower than what you would find on, say, a Corsair K70 or Razer's own BlackWidow X Chroma. Using the supplied magnetic wrist rest, which is decked in a plush leather material that feels lifted from a sports car's seats, the Ornata feels equally suitable for Overwatch sessions that stretch into the night in addition to bashing out long documents. Removing one of the Ornata's keycaps reveals a square-shaped plastic-and-metal stem that resembles Logitech's Romer-G switch, which is found in the company's G810 keyboard and also aims for a hybrid membrane-mechanical feel. 'Mecha-Membrane' feels snappier. It retains the tactile feel of Razer's Green switch, which is basically Cherry's MX Blue switch in disguise. There's still an audible click, but the Ornata's keys feel much more effortless to type on due to their shorter switch stem, sculpted shape and reduced keycap height. We were able to swiftly and accurately bash out words without losing the reassuring tactile feedback you get with taller mechs. It's bound to especially appeal if you're used to typing on laptop-style chiclet-spaced keyboards. Elsewhere, the Ornata's features impress. 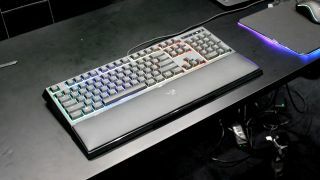 Its customizable RGB Chroma backlighting is simply gorgeous - it doesn't so much bleed between keys as flow between them like a rainbow of multi-color lava, each key floating like an island bathed in a constantly shifting hue. It can also be synced with Razer's other peripherals using the company's Synapse software. There's a few other gaming-related features to speak of, including anti-ghosting with 10-key rollover, a gaming mode that disables the Windows button and programmable keys with on-the-fly macro recording. There's a lot to like about the Ornata - there simply isn't another low-profile mechanical keyboard on the market like it. Cherry's MX Board 6.0 is comparable in terms of its solid build quality and low-profile wrist position, but it's only available with Cherry's linear Red switch which is far less satisfying to type on. The QS1 switch found in SteelSeries' Apex M800 is great for gaming, but it's too sensitive and prone to accidental keypresses for lengthy typing sessions. On the other hand, the Ornata's click isn't quite as pronounced and the travel not as deep as other mechanical keyboards with full-sized OEM keycaps; it probably won't replace your keyboard with Cherry MX Clears any time soon if you enjoy that full-bodied tactile feel. However, if you're interested in having the still-noticable click of a Blue switch combined with low-profile keycaps and some nifty gaming features, then the Ornata might be just what you're looking for. It's set to hit the shelves in October priced at $79.99 (around £60, or €70).